Stuart Douglas, General Manager of DoubleTree by Hilton Edinburgh – Queensferry Crossing and Caroline Warburton, VisitScotland Regional Leadership Director. The photographer was Graham Clark. A Fife hotel, which is helping to revitalise North Queensferry, is celebrating after earning a 4-star grading from VisitScotland. 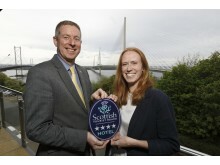 The DoubleTree by Hilton Edinburgh – Queensferry Crossing achieved the award on the first time of asking following its relaunch as a DoubleTree by Hilton hotel in August 2017. 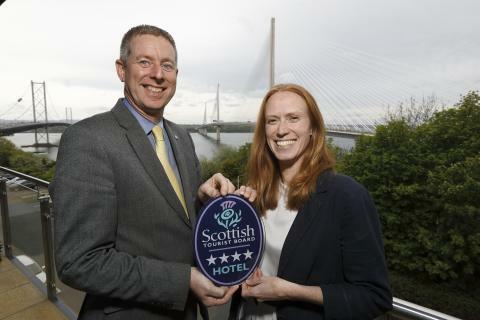 Having recently undergone a multi-million pound makeover, the hotel, which boasts stunning views of the three Forth Bridges spanning the Forth Estuary, has been credited with not only providing high-end accommodation for visitors but also employment opportunities for the local community. Taken over by the family-run Cairn Group in 2013, the property became part of the DoubleTree by Hilton franchise and has benefitted from a £15m refurbishment as well as a change in service standards, allowing it to achieve its four-star grading. The hotel has also doubled the number of bedrooms and transformed the hotel’s restaurant into the Shore Grill & Fish House. 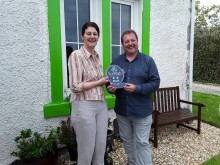 Following a VisitScotland Quality Assurance visit, the hotel was praised for providing excellent standards of cleanliness and service. Staff members were also commended for being friendly and approachable while providing outstanding service, helping to exceed guests’ needs and expectations throughout the duration of their stay. 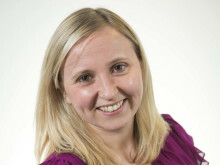 Caroline Warburton, VisitScotland Regional Leadership Director said: “My congratulations go to everyone at DoubleTree by Hilton Edinburgh – Queensferry Crossing on their four-star grading. 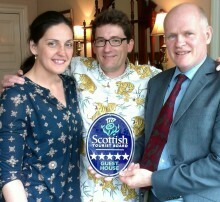 It is well deserved and recognition of the quality of the experience which the team is offering their guests. Delivered by a dedicated team of experts who offer scheme members advice and support on how to not only meet visitor expectations but exceed them, the scheme aims to drive standards and encourage excellence whilst helping businesses reach their full potential and secure their success.